The class party time is upon us! Class parties can be a lot of fun, but they can also be a lot of work. I have been involved in class parties since Brayden (now in fourth grade) was in Kindergarten. 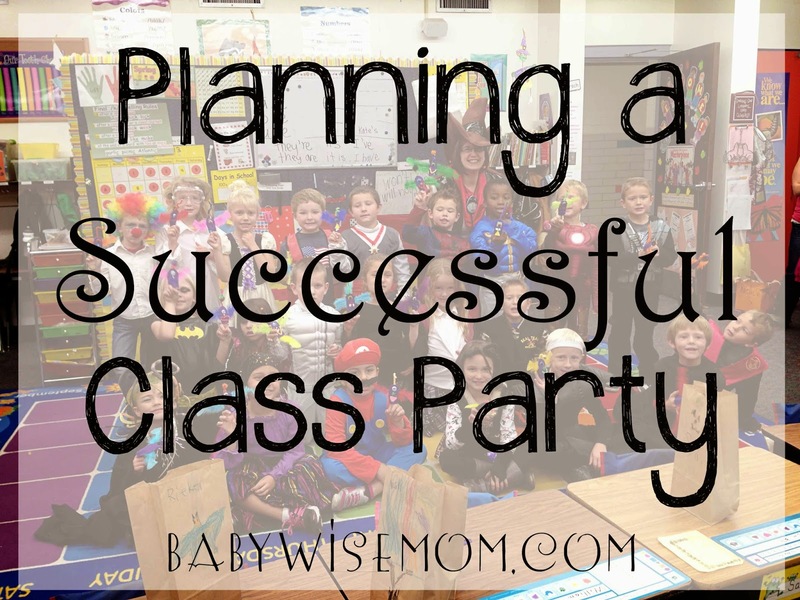 Here are some tips to help you have a successful class party. You might want to mix up the order of steps, but consider each step in your planning process. While you have known about the game of tic-tac-toe for about the last 30 years, these children are just discovering it. We often make things bigger and grander than they need to be for children. Children are okay with simple. They enjoy simple. I look at this as a “good, better, best” situation. Is it best to make your first graders class party have an appearance worthy of Pinterest, or are there other things you can be doing with that time that are actually “best”? Children are thrilled with the simple, so don’t make it harder than it has to be (and this really applies to pretty much anything you plan for kids, from family vacations to birthday parties to daily summer activities). The first thing to find out is how much time does the teacher want you to take for the party. Most teachers at our school like us to take one hour (one I have had goes longer). With one hour, I plan for 3-4 activities (usually 3). We divide the class into 3 groups and have each group be about 20 minutes long. How many groups you can do will depend on how much help you have. You will want an adult running each station, so if you have 4 helpers, you can have 4 stations. 3 means 3 stations. Once you know the time and how long each station will be, you know how long each activity needs to take. This will help guide you in choosing activities. The next thing you will want to find out is how much help you will have. Ask the teacher if she would like to be over a center or if she would like to roam the room. I have had teachers go both ways, though I would say even the teacher willing to do a center loves to be able to go all around the room and observe the party as a whole. Consider how much time you have, how many students you have, and how many centers you want to have. I like to have 3-4 groups, so that means there needs to be 3-4 moms there helping. I find as a general rule, parents are more eager and willing to help in younger grades than in older grades. In a child’s Kindergarten class, there will easily be 6 moms there to help. In the third grade class, it can be work to scrape together 3 moms. And some of my kids classes just have more people willing to help than others. For example, last year, Kaitlyn’s first grade class had a lot of moms who wanted to help, while another first grade class at the same school literally had one mom doing every party. Now that you know how much time you have and how much help you will have, you can gather ideas. Sometimes I gather ideas before getting help. For example, this year I knew that in McKenna’s Kindergarten class, I would have no trouble getting help for the party. I gathered my ideas and chose the activities before asking for help. That way, when I asked someone to help, I could say, “Would you be willing to run the painting pumpkins station?” Some people are happy to help but intimidated by planning the activity. I like to break the activities up into categories. I go for a craft activity, a game, and a treat the children can assemble. You can also do another game or craft and just have a treat for them to eat at the end. There are some things you want to keep in mind when choosing activities. One is paint. Paint takes time to dry. If you are doing the party at the end of the day, you might want to have all of the children do the painting portion at the same time at the beginning and then break up into stations so the paint can dry while before it is time to go home. Another option is to talk to the teacher ahead of time and plan to let the project stay over night and the children bring it home the next day. Glue is similar–it takes time to dry. Just be sure the activity you plan can be accomplished in the time you have. You also want to be sure the activity is in general age-appropriate for the class. I have at times prepared an activity before hand and taken it to the teacher to see if she thought it would work for the class. I mostly have had this uncertainty with Brayden since he is my oldest and I am not as familiar with what children of that age in general are capable of. Once you have activities chosen, make sure you give yourself enough time to prep the activity. Have everything for the activity read to go. If you need copies, most teachers are willing to do the copies for you or will allow you to go to the workroom to make them yourself. Bring everything you need to set up the activity, do the activity, and clean up after the activity. Will you need napkins, wet wipes, soap, etc? Another thing to plan for is a way for kids to get these things from the party home if needed. Not all will eat the treat. Some will want to take it home. Baggies can be good for that. Grocery sacks can be good for taking home painted or glued project without getting it all over the inside of the backpack. Sometimes the activity you plan will go faster than you think it will. I always bring about 3 books per station so I can read a book to them if there is extra time. I bring books that go with the theme of the party, so Halloween books for Halloween party. You know the party is from 2-3. Find out what time to go to set up. You don’t want to show up at 2. You want to be ready to party at 2. Get involved and have fun with the party. This is a party! I always dress up for Halloween parties. I try to be festive and have fun with the kids. Do you have any questions, comments, or ideas for class parties?